Story Rating: 3/5 – Seems disjointed at times, unplayable really if you haven’t read books or seen movies. Environment Rating: 4/5 – The Potterverse has been translated into lego very well. Game Play Rating: Fun, but I really don’t want to replay it to get all of the hidden items to 100% the game. I’m not sure I’m cut out for Lego games, if only because I’m not a completionist. Give me the story, not-too-difficult gameplay, and a satisfactory ending and I’m usually happy. 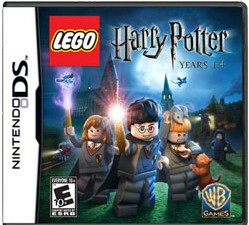 Lego Harry Potter elicited a few chuckles as I played through the well-known story and was certainly an enjoyable bedtime game. However, upon completing the story I discovered I was only 60% completed with the game. Argh! I tried to go back and gather all of the trinkets and gewgaws as required, but honestly by Book III it was more of a chore than something that was enjoyable. I have many other games to play, so I’m calling it quits at 91%.